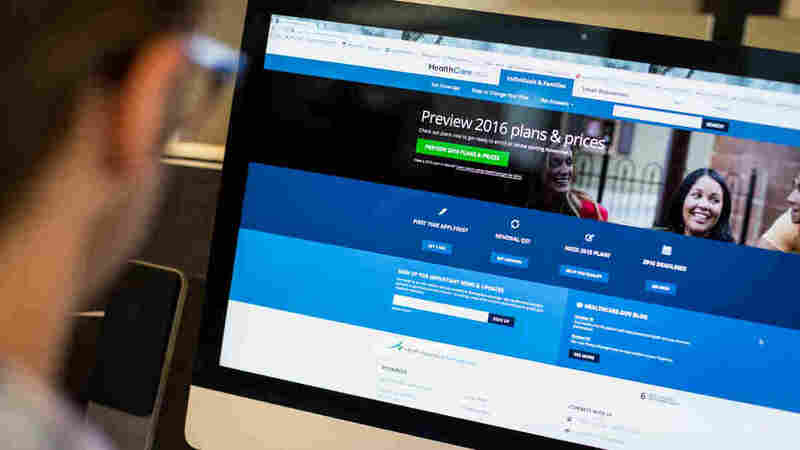 Exchange Plans May Have Higher Costs, No Out-Of-Network Coverage : Shots - Health News Enrollment for HealthCare.gov plans for 2016 begins Sunday. Insurance shoppers should check their projected health costs and each plan's network of doctors and hospitals before choosing coverage. HealthCare.gov plans for 2016 open for enrollment on Sunday. 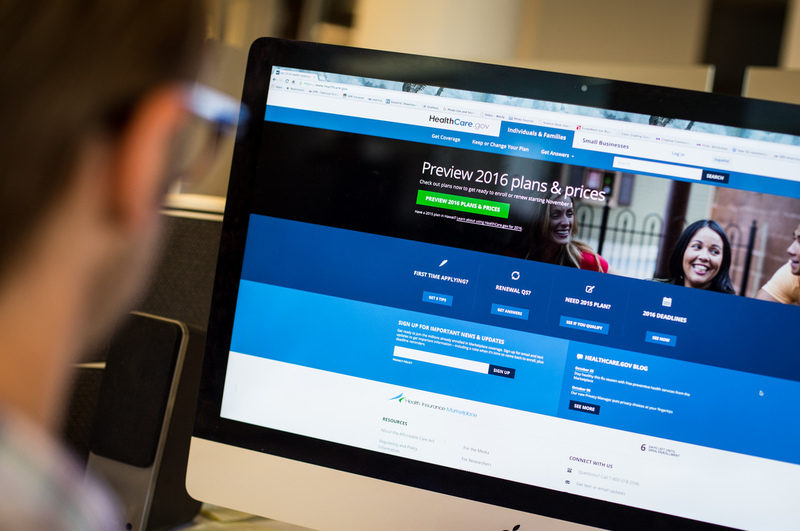 When the health insurance marketplaces open Sunday, consumers shopping for 2016 coverage may find steeper premium increases than last year and more plans that offer no out-of-network coverage. According to an analysis released Monday by the Department of Health and Human Services, the cost of the second-lowest silver plan in the states using the federal marketplace will rise an average of 7.5 percent for 2016 coverage. Silver plans are the most popular type of marketplace plan. They pay 70 percent of medical costs, on average, leaving consumers to cover 30 percent. And premium tax credits that are available to people with incomes up to 400 percent of the federal poverty level — about $47,000 for one person — are benchmarked to the second-cheapest silver plan. But the overall increase doesn't tell the whole story for those shopping for insurance in the individual market — generally people who don't get coverage through their work. Depending on the market, consumers may see larger or smaller increases or even declines in premiums. Premium changes for the second-lowest-cost silver plan ranged from a 13 percent average decrease in Indiana to a 36 percent average increase in Oklahoma. The consulting firm McKinsey & Co. earlier had analyzed premiums reported in 26 states and found that in more than half of the rating areas in those states there will be a new insurer offering the lowest-cost silver plan next year. "It's indicative of the price jockeying that's still going on in the market," says Erica Coe, co-leader of McKinsey's Center for U.S. Health System Reform. "If consumers want to have the lowest-cost silver plan, they'll have to shop." The open enrollment season for marketplace coverage runs from Nov. 1 through Jan. 31. People who want coverage to begin on Jan. 1 must buy a plan by Dec. 15. Although most consumers zero in on premiums when comparing plans, next year it could be especially important to pay attention to the network of doctors and hospitals that are part of the plans that they're considering. There are likely to be fewer plans that cover broad networks of providers, says Katherine Hempstead, who directs health insurance coverage issues for the Robert Wood Johnson Foundation. In addition, a growing number of marketplace plans will cover only doctors or hospitals in their provider networks. "The PPO and POS categories are definitely shrinking," Hempstead says, referring to preferred provider organization and point of service plans, both of which typically offer coverage of out-of-network providers, although consumers generally have to pay a larger share of the cost. Instead, consumers may see more health maintenance organizations that don't provide any out-of-network coverage. Despite the well-publicized demise of nine health insurance co-operatives and other insurer exits, carriers moving into new markets next year will most likely offset the declines. The number of carriers selling plans should be essentially unchanged at roughly 327 next year, according to McKinsey data based on 42 states. Consumers who want telephone or in-person help choosing a plan can locate assistance on the state or federal marketplace websites. In addition, Enroll America, a consumer group that focuses on health insurance enrollment, connects people with local help through its website.